To open the setup window, click the Setup button in the top right of the window. 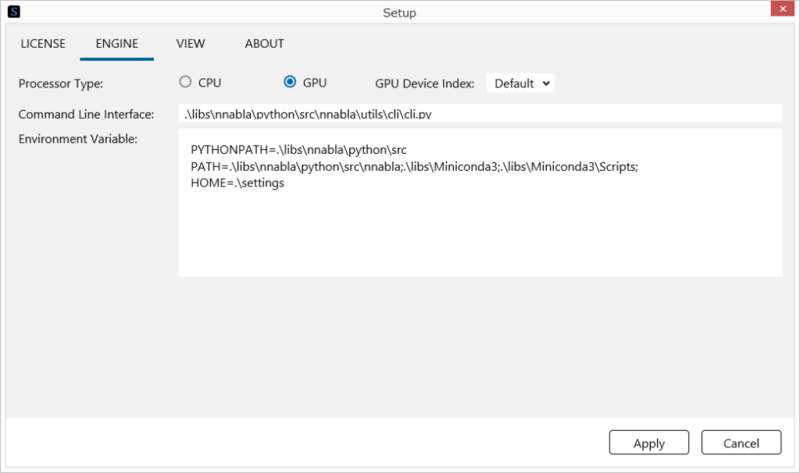 Click CPU or GPU next to Processor Type. Use GPU Device Index to specify the index (0 to 3) of the GPU to use. Through the Command Line Interface, specify the path to NNabla cli.py. In the Environment Variable box, specify the environment variables that will be used during Neural Network Libraries execution. Normally, users do not need to change these settings. Drag the GUI Scale slider to specify the zoom ratio. You can zoom the GUI display size when the setup window is not open. While holding down Ctrl and Shift, press the plus (+) or minus (-) key or rotate the mouse wheel. Click Transition to turn animation on and off.